Unipart Logistics has secured new defibrillators for our sites and donated three to the St John’s Ambulance Service: all of which could help to save lives both within our business and in the local community. Defibrillators have been in the news this week as the British Heart Foundation announced plans to create a nationwide map of locations where community defibrillators can be accessed. UL will be registering site defibrillators on the national database when this becomes available so that this potentially lifesaving resource can also be accessed by other businesses or members of the public in an emergency situation. 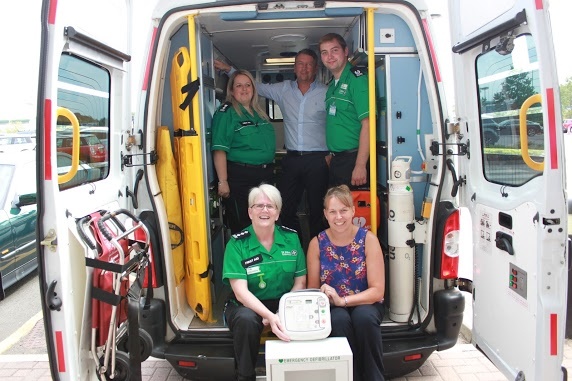 Chris Houghton, District Manager for St John’s Ambulance, said, “Every year 30,000 people suffer a cardiac arrest outside of hospital and without early defibrillation the chances of survival are minimal. This week we were reminded of this when a St John Ambulance volunteer, whilst on a train traveling to work, successfully saved someone’s life because he was able to administer early CPR and use a public access defibrillator. The donation of these three defibrillators will ensure that not only our volunteers but also the community can do the same. Our communities will now have the ability to be difference between a life lost and a life saved”.